Have you ever felt different because you knit and you’re a man? Have people ever insulted you because of your hobby and your gender? If so, how do you deal with it? Did you have a knitting teacher? If so, was your teacher male or female? Do have any other hobbies that could be considered “girly”? One of us is going to an all boys’ school for middle and high school. He also wants to bring his knitting to school sometimes, but he might get insulted. Do you have any tips on avoiding insults from people? What is your favorite project to knit? Do you know any good websites or books to get cool patterns from? What was the longest it ever took for you to knit a project? Click here to read Jared's response. Hi, I just came across your blog and really enjoy it! I think it's wonderful what you're doing for your students. It's silly when people view crafts as being gender specific. I've tried encouraging some of my male colleagues to take up knitting and they always say, "it's for grannies". That's sexist AND age-ist! Your students should be proud of what they are doing, not only are they learning a beautiful art, they acquire skill, gain something useful and spend time productively. Breaking through the boundaries that stereotypes have created is admirable. Do what you like! You go, boys! Wow! Your entire knitting club is quite wonderful and very inspiring that they raised funds for the Haiti clinic! That was a great correspondence! I hope even more men take up the needles! I learned to knit from a guy I work with. Hi Julie. I came across your blog by way of j a r e d. I must applaud you on this. You are amazing with what you're teaching these kids. I found you through jared as well. just wanted to say that its awesome what you are doing and hope all the young knitters keep on knitting! Your knitting class sounds awesome, and I think it's *wonderful* that you are helping young people break free from gender stereotypes. Bravo!! That's FANTASTIC! I've been slowing teaching my five yr old nephew to teach and so far the gender gap has alluded us. He just sees one of his favorite people doing something almost all the time. ;-) How could it be bad? I worry though because he's already deciding which "colors" are girly and what not. Hopefully we can keep the knitting gender neutral. Thank you for this. One day it may come in very handy. Fantastic - these are some really cool kids!! Knit on boys!! Good for you and for your students! I heartily believe in challenging stereotypes. Hey Colin, Jake, Brandon & Evan - always be true to yourself no matter what others think! You guys keep on knitting. I learned to crochet from my sisters and mom when I was about 8 (4th grade I think). I liked hanging out with them and that's what they did so I did, too. I made a variegated yellow bag to carry my crochet to school. This was 1977 and I don't necessarily recommend a variegated yellow bag for your knitting, but you all should be proud of what you can make with your own two hands. I don't actually remember catching too much flack, but I think if you have the right attitude, that goes a long way. Oh man, that was just the greatest response from Jared! (How did I miss this post for so long?) 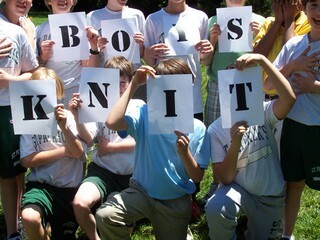 Boys knit and men knit too!